For generations, parents have drummed the principles of financial responsibility into the brains of irresponsible offspring: pay your bills on time, save all you can and above all, stay out of debt. While the first two certainly still apply, in today’s financial climate, that last one may not be as ironclad a marker of savvy money management as it used to be. As financial and investing experts point out, some debt can actually be good – such as the mortgage on residential or investment property. Keeping a mortgage rather than paying it off is a cornerstone of Jason Hartman’s investing strategies, and a new Bankrate article offers more compelling reasons for not paying off that loan, particularly since current interest rates remain so low. Lenders typically allow borrowers to make additional payments or to pay a larger amount in some payments in order to shave months or years off the term of the loan. While eliminating mortgage debt may be admirable, experts point out that the money spent to do that can actually be better used for other purposes. Advocates of paying off mortgages as soon as possible point to the many struggling homeowners in jeopardy of losing their homes because of problems making a monthly mortgage payment. 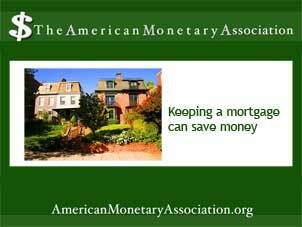 Eliminating that payment altogether as soon as possible creates more financial stability Although that may be true, the many refinancing and mortgage assistance programs offered by major lenders and government mortgage servicers make it possible to negotiate new terms with lower interest rates. And, financial experts point out, owning a property free and clear eliminates some tax deductions, such s mortgage interest or losses due to vacancy.